The STEM (science, technology, engineering and math) community has been running full speed ahead with activities this past month. 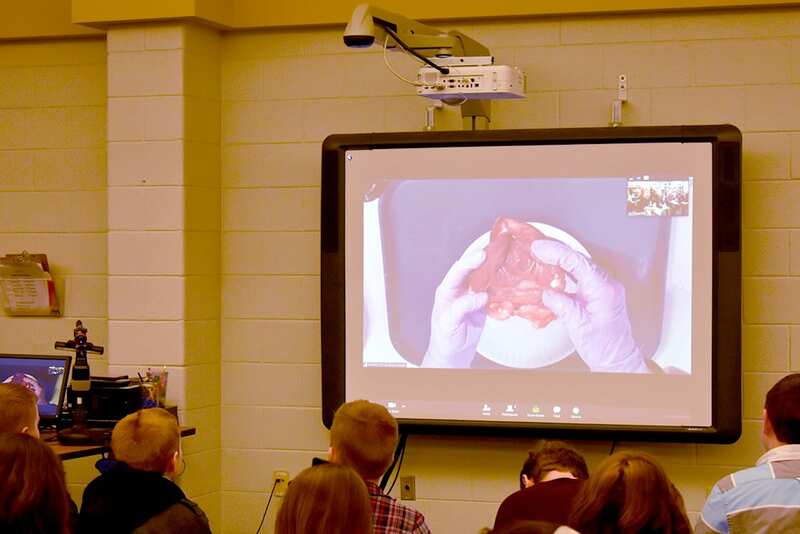 The fifth grade class at Mountain View Intermediate School (MVI) was able to watch and interact with a heart dissection, live from a Denver Hospital. Students in Mrs. View’s class prepared for the procedure by analyzing several different body parts during science class last week. 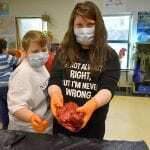 Students were able to touch deer and pig hearts, kidneys, and lungs from various animals. There were even skeletal parts from a deer that students could put back together to form a spine and cranium. A member of the fire department was on hand to help students inflate and deflate the lungs. As air was pumped into the lungs students noticed that the right side inflated fuller than the left. This led to a discussion on whether the animal might have had a disease of the lungs. It was determined that the animal did actually have some lung issues and that was why only one side inflated to its full capacity. They also took note that the right side was softer than the left, also indicating a medical problem. Two hearts were examined and students were able to investigate the chambers and inner arteries and veins of the hearts. After learning about these body parts the students were ready to help with a live heart dissection the following week. The class assembled in the library where the interactive dissection would take place, via a live feed from the hospital. A medical technologist greeted the students and she explained that they could ask questions as the procedure took place. Students were given a packet of questions with diagrams to help them understand the procedure in more detail. As the technologist showed the students the heart she explained about how a heart works. She spoke about the four chambers, the separation of CO2 from oxygen and how the respiratory system and heart interact. The heart they were working with was from a sheep. 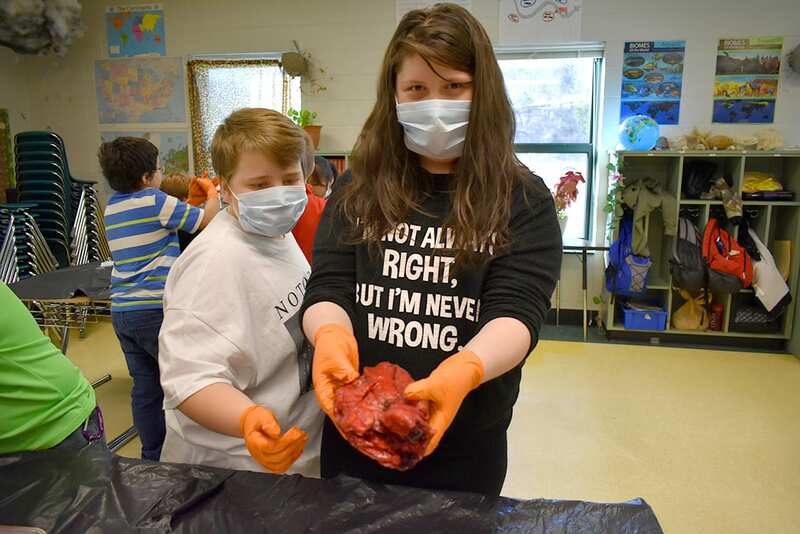 Students were amazed that the heart was a bit larger than the human heart. As students raised their hands to ask questions the technologist was able to answer some of their questions by showing the heart to the students and pointing out the areas in question. She began to cut the heart in sections to see the inner workings of each chamber. She also pointed out how rubbery the veins inside were and how much larger the aorta and valves were compared to the veins. Students asked questions about why one would have a heart attack and why parts of the heart were deeper red and other parts appeared white. The culminating activity for the students was to take their pulse for one minute while sitting quietly and then compare it to their pulse after running in place for one minute. They discovered that their pulse was much faster after exercising. The majority of the class agreed that this was a cool activity and they would like more “hands on” activities in the future. When the students returned to their classroom they had a discussion regarding the experience they had with the live dissection and the examination of the organs in class earlier in the month. Here are some of their thoughts about what they learned this past month. Samantha Bullis, science teacher at MVI has been preparing her students for a competition on March 23, in Asheville. Fifth grade students had to choose their project from 19 categories allowed in the event. Teams of two to four students worked together to build, study and perfect their entry. “Work it Out” is a relay race but instead of passing batons, they passed questions to teammates. Gracie Riddle, Lydia Cabe, Charlotte McSwain, MaggieShields, and Eve Hoffman will be competing in this event, working on science and math questions regarding force, motion and temperature. “Energy Matters” is another category involving physical and chemical changes. Anna Noel and Penelope West were diligently working on their project on physical properties of matter and the behavior of solids, liquids and gasses before and after undergoing changes or interactions. “Rock Star” involves identifying the rock cycle. Clara Stork, Abigail Brenner and Kaden Kopp decided on this category. They had many different rocks to examine and were studying how rocks change from lava to magma to sediment and so on. The cycle is continuous. Neither of the three students knew anything about rocks or the rock cycle before tackling this category. The three of them all said they found this category interesting. “Pro Gamers” was yet another category in which students have to create an interactive computer game. Brock Bradley and Hudson Stringer were working in the computer room diligently trying to create their video game. They had to choose from a variety of icons or symbols that would come together in the game to create a “cool” gaming experience. “It’s not as easy as it looks,” they both admitted. They had to figure out how to make the characters move once placed in the game. Although they chose an icon that appeared to have motion in the batch they could choose from, when they placed it into the game it did not move. It was up to them to figure out how to solve this dilemma. They both felt confident that they would succeed and be able to figure it all out. The “Pasta Tower” event calls for students to design and build the lightest tower, constructed only of pasta and glue, with the greatest structural efficiency, capable of supporting a load of up to 10kg. Ashley Flores and Isabella Shope decided to tackle this task. Their table was loaded with pasta which they had to cut and glue and put together to form their tower. Eliza Cerri and Paytin Maywell were also helping as alternates in case they were needed. 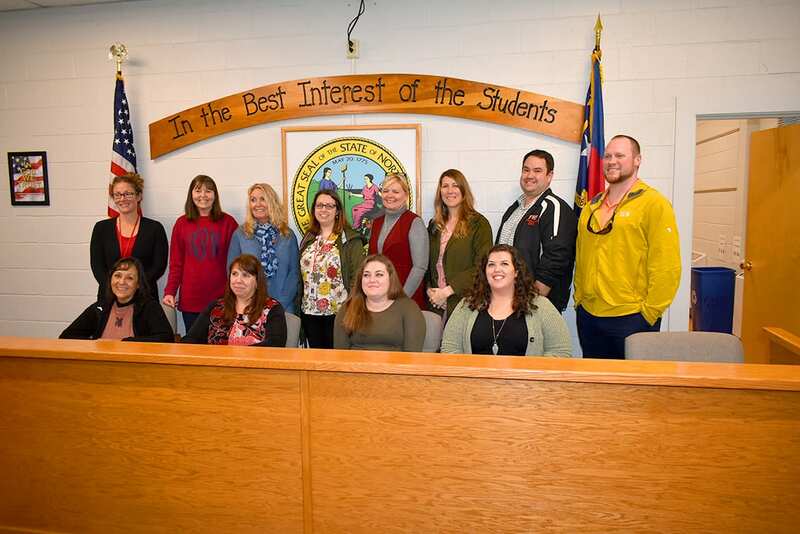 Twelve teachers from Franklin area schools were able to take part in a STEM Workshop that included touring several local businesses in Franklin. Jenifer Love, coordinator of the STEM Program, arranged the workshop with funds from the Golden Leaf Foundation Grant. 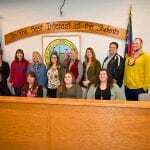 Love thought that by touring local businesses teachers could find out just what the community has to offer graduating high school and college students. What they discovered was far more than they ever realized about businesses in Franklin. Meghan Peck was in a small group that toured Drake Enterprises. Drake is well know for its tax program but Peck found out that there was much more to Drake than just taxes. Teacher Jesse Buchanan followed in the steps of the Public Works Director and county engineer Nathanael Moore during his daily duties. Buchanan said that he was very impressed at the wide variety of the tasks that Moore and his crew had to perform. Moore is involved in water and waste water plants as well as maintenance of water and sewer collection and distribution. They did everything from digging with their hands in wet muddy dirt to placing intricate parts on sewer lines when needed. Buchanan said he did not realize the extent of what was needed to perform this job until he shadowed him. TekTone was another business which was visited. At TekTone the consensus was similar to that of other businesses. Teresa Mallonee, vice president of Human Resources, spoke about how employees are lacking “soft skills.” Employees can be taught about the business but they are not being taught how to talk to customers in sales and marketing. Some of the skills that they felt were necessary for their market were phone etiquette, sending and answering e-mails properly, being flexible, being on time and able to do presentations. In just the last three years, Tektone has grown from 72 employees in 2016 to currently employing 94. As TekTone continues to grow, the need for qualified employees will increase and although people can learn the ins and outs of the company business, if the soft skills are missing they will not be hired. Mallonee said that TekTone’s internship programs help employees with further education.